Among the many charms of Peace Boat, one is the onboard ‘Culture School’, which has classes almost every day. These classes include watercolour painting, Hula, and yoga to name a few, and is a great place for people to find new interests and meet people. Today was the final dance party for the Ballroom dancing class, one of the culture school classes. 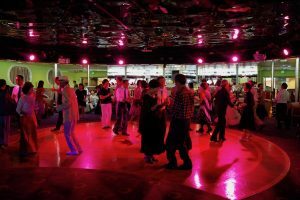 Through different dances such as the waltz, mambo, and cha cha cha, the passengers put their newfound steps and rhythm to good use enjoying one last dance time. 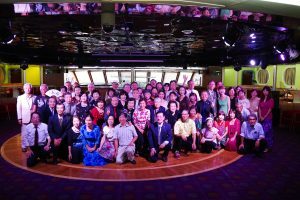 Through ballroom dancing, class members are able to meet one another almost every day, and all these familiar faces are now gathered together for one final group photo. After the party finishes, a long line forms to have a photo taken with the ballroom dancing teacher Minami Atsuko. More than just dancing, the class became a place for people to meet and get to know each other, with classmates often going out together in port, and it is these connections that will continue on once the voyage has finished. Looking back on the voyage that was, this is but one small yet important chapter in a remarkable journey.